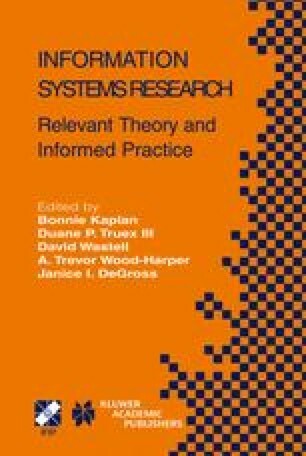 The issue of the legitimacy of Information Systems is important for researchers in this field because other disciplines have begun to lay claim to research topics often thought to belong to the domain of IS research, and the field itself is under challenge in academic intuitions around the world (Avison 2002). Benbasat and Zmud’s (2003) opinion is that IS has gained socio-political legitimacy but not cognitive legitimacy in large measure because the object of study in much IS research is not clearly delineated. In part, they are defining a disciplinary boundary issue and beginning to define criteria by which our field may be distinguished from reference disciplines or other related disciplines. Therefore, to gain more cognitive legitimacy, a clearer understanding of what we mean by “an information system” and of the central issues driving its creation and use is needed if it is at the core of that which we study. This paper advances that discourse by examining the role of a handful of French scholars, many of whom are not well known out of French academic circles, but whose thoughts on the issue are useful in furthering the debate on the ontological grounding of our field.